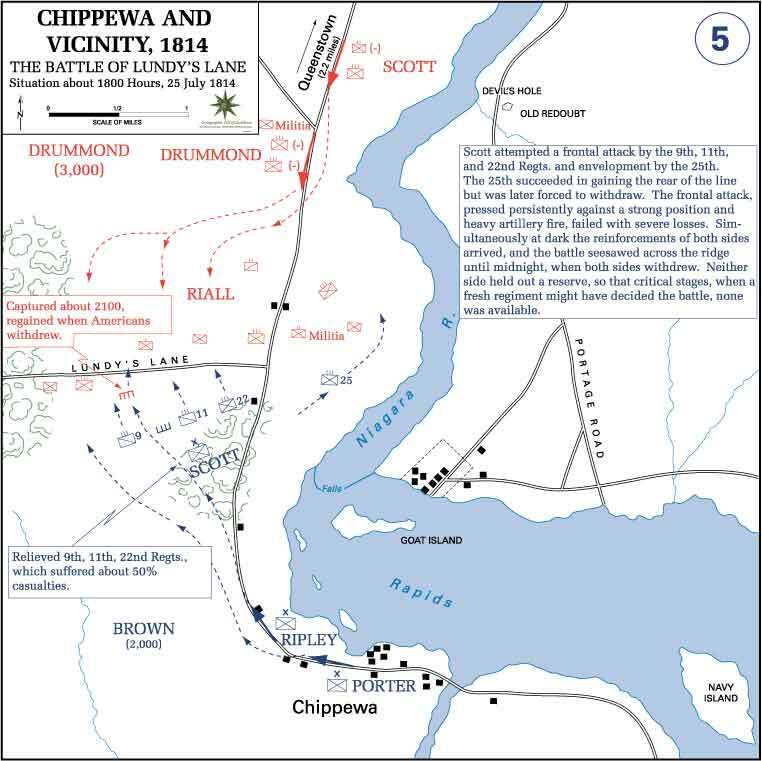 On July 25th 1814, the Battle of Lundy's Lane, near Niagara Falls, took place. In the course of the battle, 2,000 men, commanded by General Gaines for the Americans and General Drummond for the British, exchange in intense fire. Eight hundred and fifty men on both sides are casualties. On December 29th the USS Constitution under the command of Captain Bainbridge was off the coast of San Salvadore. Bainbridge spotted a British ship closer to shore. The ship was the 38 gun HMS Java commanded by Captain Henry Labert. The Java was quicker then the Constitution while the 44 gun Constitution out gunned the Java. The Java was towing an American Merchant ship that it had captured. When it spotted the Constitution it sent its captured ship into San Salvador Harbor and raced to face the Constitution. At 2PM the two ships were within cannon range. The two sides faced each other with broadsides While the Java initially out maneuvered the Constitution, the latters larger number of guns and the greater accuracy of its gunnery took a steady toll on the Java. By 3PM Captain Lambert had concluded that his only hope was to board the Constitution. That attempt failed when an accurate broadside struck his ship by the constitution that brought down his Top Mast and foremast. By 4:20 the Java’s main mask fell. An hour later when the Constitution was nearing for another run on the stricken ship the Java struck her colors and surrendered.